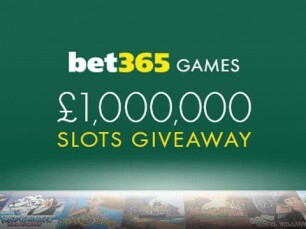 Each day in February, bet365 is giving players a chance win big. Every £10 wagered playing slots will earn a ticket for a chance to win up to £5,000! There will be made 60,000 drawings in February to distribute a total sum of 1 Million pound given away! Promotional period runs from 00:00 UK Time on 1st February until 23:59 UK Time on 28th February. Prize draw qualification rounds run from 00:00 UK Time on Monday until 23:59 UK Time on Thursday, and then 00:00 UK Time on Friday until 23:59 UK Time on Sunday. You can earn one prize draw ticket for every £10 cash staked on Featured Games. Two prize draw tickets will be awarded for every £10 cash wagered on Double Ticket Games. For an entire list of qualifying games view Full Terms and Conditions. Prize draw dates are: 5th, 8th, 12th, 15th, 19th, 22nd, 26th and 29th February. The Million Pound Giveaway will be taking place throughout the month of February, and it will be active in the Casino, Bingo, Games and Vegas portions of the firm’s gambling lineup. Just play on the games you enjoy from within these categories, and you’ll accumulate prize draw entries without having to do anything special.